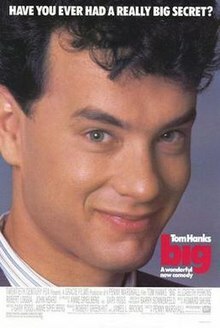 Big is a 1988 American fantasy comedy film directed by Penny Marshall, and stars Tom Hanks as Josh Baskin, a young boy who makes a wish "to be big" and is then aged to adulthood overnight. The film also stars Elizabeth Perkins, David Moscow as young Josh, John Heard and Robert Loggia, and was written by Gary Ross and Anne Spielberg. 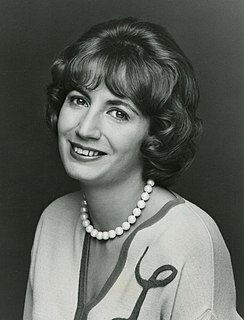 Carole Penny Marshall was an American actress, director and producer. She came to notice in the 1970s for her role as Laverne DeFazio on the television sitcom Laverne & Shirley (1976–1983), receiving three nominations for the Golden Globe Award for Best Actress – Television Series Musical or Comedy for her portrayal. Twelve-year-old Josh Baskin, who lives with his parents and infant sister in Cliffside Park, New Jersey, is told he is too short for a carnival ride called the Super Loops, while attempting to impress Cynthia Benson, an older girl. He puts a coin into an unusual antique arcade fortune teller machine called Zoltar, and makes a wish to be "big". It dispenses a card stating "Your wish is granted", but Josh is spooked to see it was unplugged the entire time. Cliffside Park is a borough in Bergen County, New Jersey, United States. 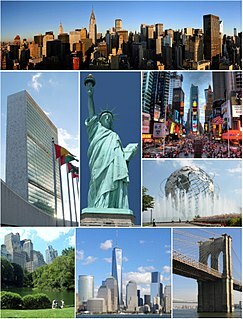 As of the 2010 United States Census, the borough's population was 23,594, reflecting an increase of 587 (+2.6%) from the 23,007 counted in the 2000 Census, which had in turn increased by 2,614 (+12.8%) from the 20,393 counted in the 1990 Census. The next morning, Josh has been transformed into a 30-year-old man. He tries to find the Zoltar machine, only to see an empty field, the carnival having moved on. Returning home, he tries to explain his predicament to his mother, who refuses to listen and then threatens him, thinking he is a stranger who kidnapped her son. Fleeing from her, he then finds his best friend, Billy, and convinces him of his identity by singing a rap that only they know. With Billy's help, he learns that it will take a long time to find the machine, so Josh rents a flophouse room in New York City and gets a job as a data entry clerk at MacMillan Toy Company. Billy and Josh find out that it will take a month until Consumer company will find the machine. A flophouse, doss-house, or dosshouse is considered a derogatory term for a place that offers very low cost lodging, providing space to sleep and minimal amenities. Josh runs into the company's owner, Mr. MacMillan, at FAO Schwarz, and impresses him with his insight into current toys and his childlike enthusiasm. They play a duet on a foot-operated electronic keyboard, performing "Heart and Soul" and "Chopsticks". This earns Josh a promotion to a dream job: getting paid to test toys as Vice President in charge of Product Development. With his promotion, his larger salary enables him to move into a spacious luxury apartment, which he and Billy fill with toys, a rigged Pepsi vending machine dispensing free drinks, and a pinball machine. He soon attracts the attention of Susan Lawrence, a fellow MacMillan executive. A romance begins to develop, to the annoyance of her ruthless former boyfriend and coworker, Paul Davenport. Josh becomes increasingly entwined in his "adult" life by spending time with her, mingling with her friends, and being in a steady relationship. His ideas become valuable assets to MacMillan Toys; however, he begins to forget what it is like to be a child, and he never has time to hang out with his best friend Billy because of his busy schedule. FAO Schwarz is an American toy brand and store. The company is known for its high-end toys, life-sized stuffed animals, interactive experiences, brand integrations, and games. The Walking Piano, also called the Big Piano by its creator, Remo Saraceni, is an oversized synthesizer. Merging dance, music, and play, it is played by the user's feet tapping the keys to make music. 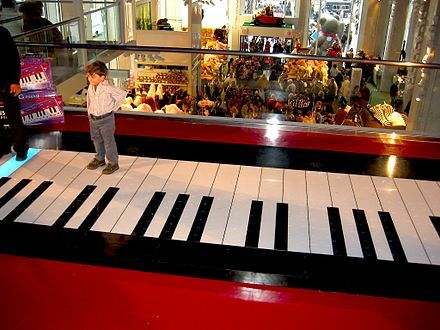 Versions of the piano have been installed in museums, children's hospitals, and other public places around the world. "Chopsticks" is a simple, widely known waltz for the piano. Written in 1877, it is the only published piece by the British composer Euphemia Allen. Allen—whose brother was a music publisher—was sixteen when she composed the piece, with arrangements for solo and duet. The title "Chop Waltz" comes from Allen's specification that the melody be played in two-part harmony with both hands held in a vertical orientation, little fingers down and palms facing each other, striking the keys with a chopping motion. The similar "The Coteletten Polka" also was first heard in 1877, with the piano collection Paraphrases elaborating on the theme by 1879. "Chopsticks" continues to be popular in various forms of media. Josh learns from Billy that the Zoltar machine is now at Sea Point Park. He leaves in the middle of presenting their proposal to MacMillan and other executives. Susan also leaves, and encounters Billy, who tells her where Josh went. At the park, Josh finds the machine, unplugs it and makes a wish to become "a kid again". He is then confronted by Susan, who, seeing the machine and the fortune it gave him, realizes he was telling the truth. She becomes despondent at realizing their relationship is over. He tells her she was the one thing about his adult life he wishes would not end and suggests she use the machine to turn herself into a little girl. She declines, saying that being a child once was enough, and takes him home. After sharing an emotional goodbye with Susan, he becomes a child again. He waves goodbye to Susan one last time before reuniting with his family. The film ends with Josh and Billy hanging out together, with the song "Heart and Soul" playing over the credits. Thomas Jeffrey Hanks is an American actor and filmmaker. Hanks is known for his comedic and dramatic roles in such films as Splash (1984), Big (1988), Turner & Hooch (1989), A League of Their Own (1992), Sleepless in Seattle (1993), Apollo 13 (1995), You've Got Mail (1998), The Green Mile (1999), Cast Away (2000), Road to Perdition (2002), Cloud Atlas (2012), Captain Phillips (2013), Saving Mr. Banks (2013), and Sully (2016). He has also starred in the Robert Langdon film series, and voices Sheriff Woody in the Toy Story film series. He is one of the most popular and recognizable film stars worldwide, and is widely regarded as an American cultural icon. David Raphael Moscow is an American film and stage actor, writer, director, producer and activist. He is best known for his role as the young Josh Baskin in the 1988 film Big. Elizabeth Ann Perkins is an American actress. Her film roles have included About Last Night... (1986), Big (1988), The Flintstones (1994), Miracle on 34th Street (1994), and Avalon (1990). She is also well known for her role as Celia Hodes in the Showtime TV series Weeds, for which she received three Primetime Emmy nominations and two Golden Globe nominations. The film was nominated for Academy Awards for Best Actor (Hanks) and Best Original Screenplay. The film opened #2 with $8.2 million its first weekend. It would end up grossing over $151 million ($116 million USA, $36 million international). It was the first feature film directed by a woman to gross over $100 million. In 1996, the film was made into a musical for the Broadway stage. It featured music by David Shire, lyrics by Richard Maltby Jr., and a book by John Weidman. Directed by Mike Ockrent, and choreographed by Susan Stroman, it opened on April 28, 1996 and closed on October 13, 1996, after 193 performances. 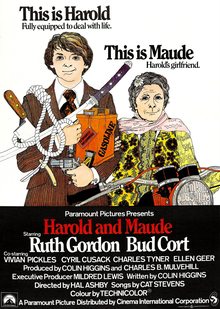 Harold and Maude is a 1971 American romantic black comedy drama directed by Hal Ashby and released by Paramount Pictures. It incorporates elements of dark humor and existentialist drama. The plot revolves around the exploits of a young man named Harold Chasen who is intrigued with death. Harold drifts away from the life that his detached mother prescribes for him, and slowly develops a strong friendship, and eventually a romantic relationship, with a 79-year-old woman named Maude who teaches Harold about living life to its fullest and that life is the most precious gift of all. The Princess Bride is a 1987 American romantic comedy fantasy adventure film directed and co-produced by Rob Reiner, starring Cary Elwes, Robin Wright, Mandy Patinkin, Chris Sarandon, Wallace Shawn, André the Giant and Christopher Guest. Adapted by William Goldman from his 1973 novel of the same name, it tells the story of a farmhand named Westley, accompanied by companions befriended along the way, who must rescue his true love Princess Buttercup from the odious Prince Humperdinck. The film effectively preserves the novel's narrative style by presenting the story as a book being read by a grandfather to his sick grandson. 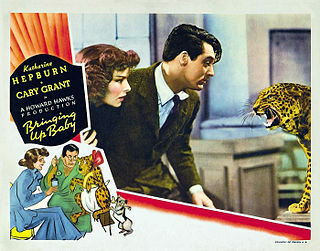 Bringing Up Baby is a 1938 American screwball comedy film directed by Howard Hawks, starring Katharine Hepburn and Cary Grant. It was released by RKO Radio Pictures. The film tells the story of a paleontologist in a number of predicaments involving a scatterbrained heiress and a leopard named Baby. The screenplay was adapted by Dudley Nichols and Hagar Wilde from a short story by Wilde which originally appeared in Collier's Weekly magazine on April 10, 1937. Modern Times is a 1936 American comedy film written and directed by Charlie Chaplin in which his iconic Little Tramp character struggles to survive in the modern, industrialized world. The film is a comment on the desperate employment and financial conditions many people faced during the Great Depression, conditions created, in Chaplin's view, by the efficiencies of modern industrialization. The movie stars Chaplin, Paulette Goddard, Henry Bergman, Tiny Sandford and Chester Conklin. Arthur is a 1981 American comedy film written and directed by Steve Gordon. It stars Dudley Moore as the eponymous Arthur Bach, a drunken New York City millionaire who is on the brink of an arranged marriage to a wealthy heiress, but ends up falling for a common working-class girl from Queens. It was the first and only film directed by Gordon, who died in 1982 of a heart attack at age 44. Splash is a 1984 American fantasy romantic comedy film directed by Ron Howard, written by Lowell Ganz and Babaloo Mandel, and starring Tom Hanks, Daryl Hannah, John Candy and Eugene Levy. The film involves a young man who falls in love with a mysterious woman who is secretly a mermaid. The film was nominated for an Academy Award for Best Original Screenplay. City Slickers is a 1991 American western comedy film, directed by Ron Underwood and starring Billy Crystal, Daniel Stern, Bruno Kirby, and Jack Palance, with supporting roles by Patricia Wettig, Helen Slater, and Noble Willingham. Bull Durham is a 1988 American romantic comedy sports film. It is partly based upon the minor-league baseball experiences of writer/director Ron Shelton and depicts the players and fans of the Durham Bulls, a minor-league baseball team in Durham, North Carolina. The Seven Year Itch is a 1955 American romantic comedy film based on a three-act play with the same name by George Axelrod. The film was co-written and directed by Billy Wilder, and stars Marilyn Monroe and Tom Ewell, reprising his Broadway role from the play. It contains one of the most notable images of the 20th century – Monroe standing on a subway grate as her white dress is blown upwards by a passing train. The titular phrase, which refers to declining interest in a monogamous relationship after seven years of marriage, has been used by psychologists. The Purple Rose of Cairo is a 1985 American romantic fantasy comedy film written and directed by Woody Allen, and starring Mia Farrow, Jeff Daniels, and Danny Aiello. Inspired by Sherlock Jr., Hellzapoppin', and Pirandello's Six Characters in Search of an Author, it is the tale of a film character named Tom Baxter who leaves a fictional film of the same name and enters the real world. The Major and the Minor is a 1942 American comedy film starring Ginger Rogers and Ray Milland. It was the first American film directed by Billy Wilder, and launched his lengthy directing career. The screenplay by Wilder and Charles Brackett is based on the play Connie Goes Home by Edward Childs Carpenter. Big The Musical is a 1996 musical adaptation of the 1988 film starring Tom Hanks. 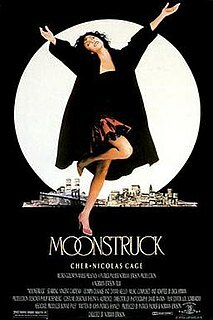 It was directed by Mike Ockrent and featured music by David Shire and lyrics by Richard Maltby, Jr., with choreography by Susan Stroman. It involves Josh Baskin, a 12-year-old boy who grows up overnight after being granted a wish by a Zoltar Speaks machine at a carnival. With the aid of his best friend, Billy, he must cope with his new adulthood while finding the machine so that he can wish himself back and more. 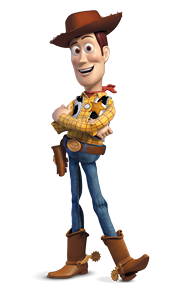 Sheriff Woody Pride is a fictional character and the main protagonist in the Toy Story franchise created by Pixar. He is a floppy pullstring cowboy doll and the leader of the toys in the movies. His facial features are based on Tone Thyne, a former Disney animator. He is voiced by Tom Hanks in the feature-length films and short films, and Tom's brother Jim Hanks in video games and shorts. A fortuneteller machine is a type of amusement, which upon receiving credit gives out a card with a prediction of the reader's future. They could be found in penny arcades, and can be seen in modern video arcades and amusement parks. 1 2 "Big - Box Office Data, DVD and Blu-ray Sales, Movie News, Cast and Crew Information". The Numbers . Retrieved January 16, 2015. ↑ "Big (1988)". Rotten Tomatoes . Retrieved January 1, 2019. ↑ "Find CinemaScore" (Type "Big" in the search box). CinemaScore . Retrieved January 9, 2019. ↑ Maslin, Janet (June 3, 1988). "Review/Film; Tom Hanks as a 13-Year-Old, in 'Big'". The New York Times . Retrieved September 1, 2009. ↑ Harmetz, Aljean (January 15, 1990). "The Media Business; Buchwald Ruling: Film Writers vs. Star Power". The New York Times . Retrieved September 23, 2011. ↑ "15 Huge Facts About 'Big'". Mental Floss . Retrieved 2016-07-05. ↑ "AFI's 100 Years...100 Laughs" (PDF). American Film Institute . Retrieved 2016-08-06. ↑ "AFI's 10 Top 10: Top 10 Fantasy". American Film Institute . Retrieved 2016-08-06. 1 2 "Big (1988)". Box Office Mojo . Retrieved September 1, 2009. Little - A similar film. Wikimedia Commons has media related to Big (film) .